Today’s young college graduates face a more challenging labor market—higher unemployment, higher underemployment, and lower wages—than their older siblings did before the Great Recession. In fact, the average wages of young college graduates—college graduates between 21 and 24 who are not enrolled in further schooling—are 2.5 percent lower than they were 15 years ago. In 2015, young college graduates had an average hourly wage of $17.94, which translates into an annual income of roughly $37,300 for a full-time, full-year worker. In 2000, the average hourly wage of a young college graduate was $18.41. While wage stagnation is not unique to the newest labor market entrants, what is particularly stunning is the fact that stark wage disparities between men and women occur even at this early part of their careers. By definition, young college graduates have the same level of education—which is to say, they all have college degrees. (It should be noted that these data do not allow for differentiation between college major or college quality, whether measured in quality of education or access to career connections via alumni networks.) Young college graduates also likely have similar levels of experience. 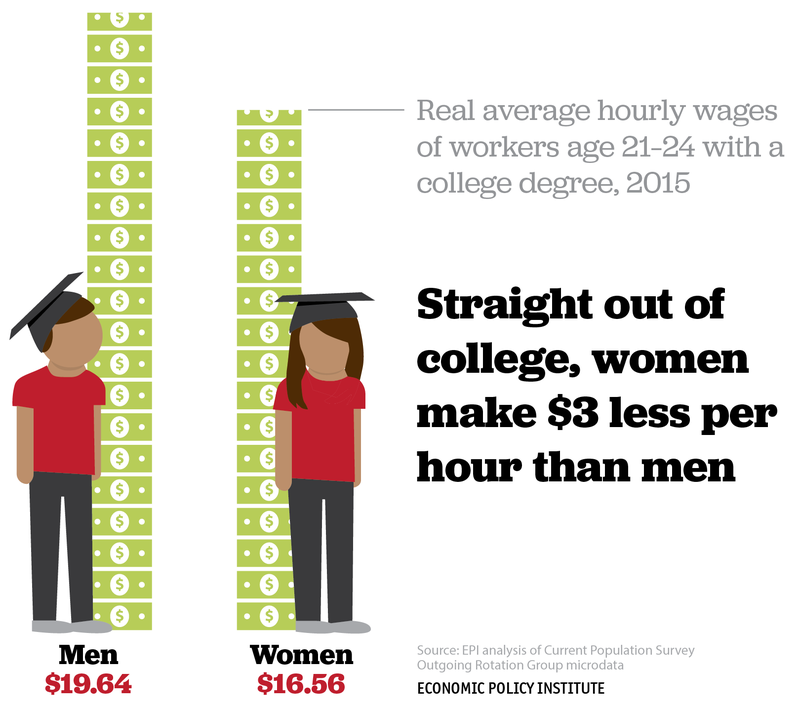 Despite these similarities, male and female expected wages upon graduation differ greatly: while young male college grads earn an average hourly wage of $19.64 early in their careers, their female counterparts earn an average hourly wage of just $16.56, or 18.6 percent less than men. Although women have seen modest wage gains in the last several decades, the main reason the gender wage gap has slowly narrowed is because the vast majority of men’s wages have stagnated or declined. The best way to close the gender wage gap for people of all educational backgrounds is for both men and women to see real wage increases, with women’s wages increasing at a faster rate than men’s. At the end of the day, all workers are sorely in need of a raise.